Egmont National Park is located on the Taranaki Peninsula on the lower west coast of the North Island. There are numerous access points to the National Park, from New Plymouth and Inglewood in the north, Stratford to the east, Hawera and Opunake to the South. Most tourist activity near the Park is centred about the large service town of New Plymouth. 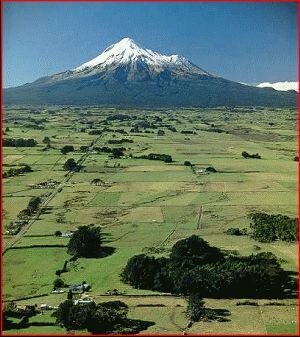 The dormant 2518 metre volcanic cone of Mt Taranaki (Mt Egmont) is certainly the prominent feature of this landscape. Its ice capped peak rises some 1800 metres above the surrounding agricultural landscape. The smaller "vent" cones of Pouakai and Patuha is to the northwest of the main massif. There are over 300km of walking tracks in the Egmont National Park, making the forests, high alpine slopes and surrounding ranges among the most accessible areas in any of New Zealands National Parks. Visitor Centres are located at Dawson's falls and North Egmont. Kapuni Walks (1 hr) - Kapuni River, Dawson Falls, Lava flows, forest. Wilkies Pools (1hr 30min) - Kapuni River, Twin Falls, Bubbling springs, beautiful forest. Kaupokonui Round Trip (4hr) - Kaupokonui River, Hasties Hill, Beehives Rock, Good views. York Track (10min - 2hr) - Old stone crushing plant, Old railway siding. The Summit Route - Starts at Dawsons Falls, climbing steeply to the summit crater. This track should not be attempted in snow conditions. An iceaxe & crampons may be required on occassions. North Egmont Summit Route - Scree climb to rocky ridgeline called the "lizard". Allow 7-8 hours return. This is a dangerous unforgiving route on the mountain. The "Round the Mountain" track must certainly be the most popular tramping route in the Egmont region. It will take you anything from 18 hours to 7 days, dependant on what level you walk the mountain, and what sections you utilise. Very well provided for with backcountry huts. An excellent tramp in the summer months, damned dangerous at higher levels in winter - Take Care ! Nearby the Pouakai and Kaitake Ranges provide alternative tramps to the Mt Egmont circuits. You may link these to the Round the Mountain track if you so desire. As has been stated earlier Mt Egmont is a killer, most victims have fallen off the ice near the summit, crashing over the tall rock bluffs to their deaths. Exposure is the second biggest killer on the mountain, with unprepared trampers being caught out by the unpredictable severe mountain weather. Having said that Mt Egmont, provides experienced climbers with excellent ice climbing conditions in the good seasons. An energetic climb, finishing the day bivying the night in the Crater, catching sunrise, then glissading the "hill" all go together to form a memorable climb. On the mountain side there are lodges, huts and campsites available, while the major centres of New Plymouth, Inglewood, Stratford provide most forms of accommodation. For those interested in Backpacker style lodgings New Plymouth provides several choices, and good transport access to the mountain (Dawson's Falls). New Plymouth is the centre of all commercial activity in the region, and provides ALL facilities. The smaller country towns do their best to provide most facilities, however choice is very limited.